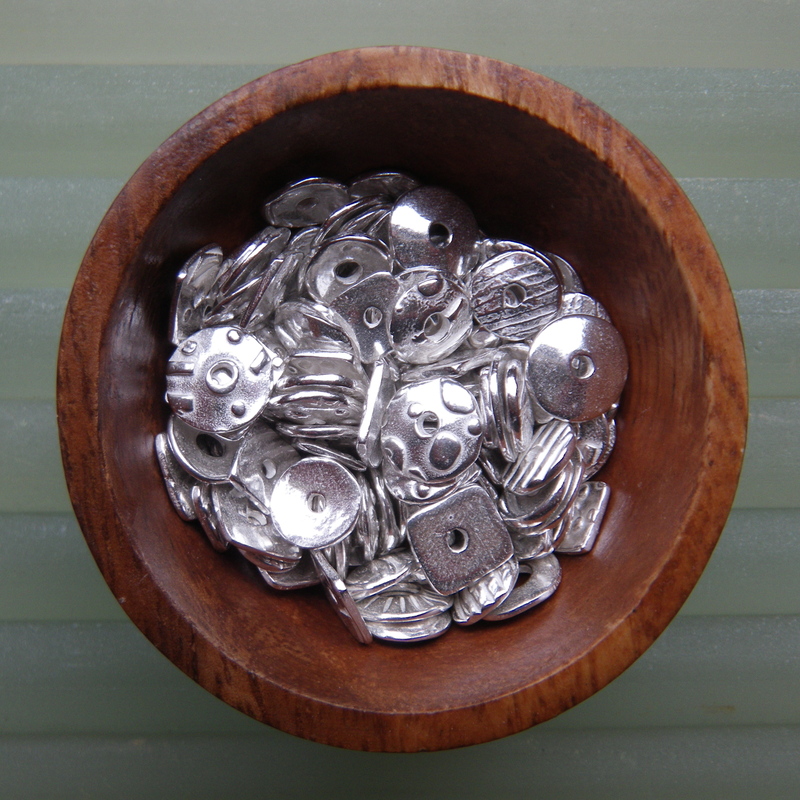 As I string necklaces and make earrings, sometimes I just want a small silver disc for an accent or to rest against a rock bead to take the focus off a less-than-perfect drill hole. When I am making larger beads with PMC (precious metal clay) I try to remember to take the scraps of fresh clay to make these little components. I know I will use them eventually, even if I don’t have a specific design in mind at the time. I usually have a few of these fired discs kicking around my bead stringing area, but I could always use more. This week I decided it would be better to have a lot more! The thing is, I did not want to open a fresh package of silver clay to make them. My clay supply is low, and for small pieces that will not be part of a hollow form or a clasp, I decided to reconstitute my scraps and broken pieces of unfired clay. The reconstituted clay is way less than perfect for many pieces of jewelry, but for these small textured pieces that will not be withstanding any direct tugging or pulling, this clay works just fine. I fired the discs at 1650º for 2 hours to maximize the density of the clay and then finished them in a tumbler with steel shot for an hour. 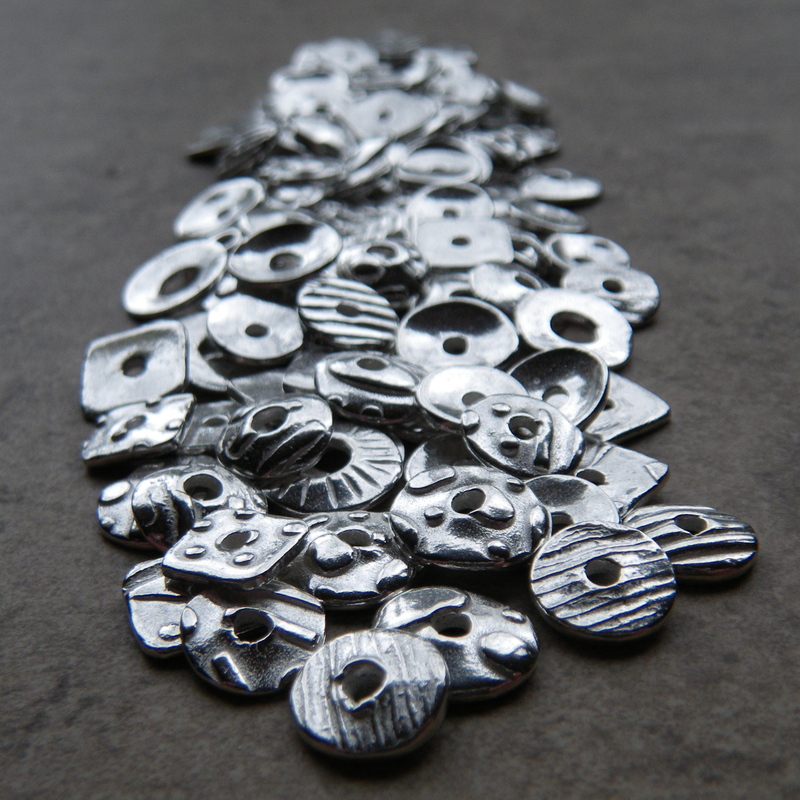 I have started to minimize the silver clay dust in my studio by cutting back on sanding unfired pieces of silver clay. Reconstituting dried out clay means working briefly with the dust I am trying to avoid. But I still end up with pieces that break before I have a chance to fire them, or designs I decide I really don’t like, and this is still a great way for me to recycle that scrap. I love these, their slight irregularity and texture. I’m going to visit your Etsy shop now to see about getting some. I’ve been seeing lots of beautiful stuff thanks to the giveaway. I hearted you. OH, and Islesford Harbor. Memories. I was lucky enough to spend two weeks there with friends in the summer when I was a teenager. I’ll never forget it. I also went out on a boat lobstering a couple times and loved the experience. Thanks! I spent lots of time last night looking at other people’s sites, too, after reading all about other people’s favorite blogs. What a great idea that was, and so generous to share that information. I hope one of us wins the beads! I’ll definitely be checking out your Etsy shop and your blog. I can’t believe you know Islesford!! ooooooo…that bottom photo is great! i wish one of those disk-doo-dads would work on my poorly-drilled-favorite-rock…unfortunately, the drill hole is rotated to the front, too…. Hey Holly, what does the other side of that rock look like?! After reading all of Kate’s info about not creating silver clay dust, I felt almost guilty grinding up the clay scraps. But, “almost” is the operative word! Do you have a page on Facebook?